For more FAQ, please visit Guest Info & FAQ. What is your policy about bringing children to a performance? We request that there be no babes in arms. As a courtesy to audience members and performers, please use discretion regarding a young child’s ability to sit quietly and enjoy a performance. If your child is having an issue with sitting quietly during the show, there are monitors on all lobby levels on which the show can be viewed. All persons, regardless of age, must have a ticket for admission. Contact the Seattle Opera’s Box Office at 206-389-7676 for information on whether a performance is suitable for children. If you are bringing a child to a performance, it may be helpful to familiarize them with the story and the score so that they know what to expect. The Pacific Northwest Ballet provides a list of the most child-friendly ballets of the season and further information about bringing a child to Pacific Northwest Ballet performances here. If you have additional questions, please contact the Ballet’s Box Office at 206-441-2424. How do I find out if a show is cancelled due to snow or other natural event? Pacific Northwest Ballet is committed to honoring its performance calendar and generally will not cancel performances for any reason. In the unlikely event the status of a performance does change, an announcement will be posted at PNB.org and PNB will attempt to notify all affected ticket buyers. Seattle Opera is committed to performing as scheduled. In the unlikely event the status of a performance does change, it will be posted at seattleopera.org. You may also call the ticket office at 206-389-7676. The voicemail will be updated if there are any changes to the schedule. In the event of significant snow in the area and you are unable to attend the performance, you may be able to exchange or donate your ticket. Visit Seattle Opera for more information on inclement weather policies. If a McCaw Hall ticketed show is cancelled, Ticketmaster will automatically send an email notification to the address provided during purchase with further instructions. You may also call Ticketmaster at 800-745-3000. Can I have someone else pick up the tickets I ordered at the box office/will call? If you purchased them via Ticketmaster, you can call 1-800-653-8000 to request an alternative pick-up option for previously purchased tickets. If you purchased your tickets directly from Pacific Northwest Ballet, call 206-441-2424. If you purchased tickets from Seattle Opera, call 206-389-7676. Photo identification will be requested at the box office window for anyone picking up tickets. If you purchased your tickets via any other source (alternative website, including ticket brokers and resell sites), our box office staff may not be able to assist you. Can I replace my tickets if they are lost or I forget them at home? If you purchased them via Ticketmaster, call 800-653-8000 to get the tickets reissued for pickup at the box office. You can always go to the box office when you arrive and have the tickets reprinted. You will be requested to show photo identification and/or account information to get tickets reprinted. How can I purchase tickets to a show? Visit Purchase Tickets for general information on purchasing tickets at McCaw Hall. If you are looking for a specific performance, visit Events & Tickets for information on purchasing your ticket! Where is seat 1 in each row? Seat 1 of each row and section is closest to center stage. In the center sections (1, 31, and 41), seat 1 is on the house right side of the section. Do you offer discounts on ticket prices? 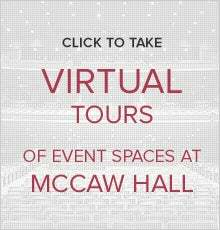 McCaw Hall and its resident tenants have special offers and promotions when available. Visit Special Offers for the most up-to-date information. How can I get information on season tickets? Season Tickets are available directly from each of our resident organizations. Visit Pacific Northwest Ballet and Seattle Opera for more information about their season tickets. Where is row AA in section 1, 2, or 3? Rows with double letters (AA, BB, and CC) are at the back of sections 1, 2, and 3. All ticket sales are final. There are no refunds or exchanges available. If you are unable to attend a Pacific Northwest Ballet performance, you may donate your ticket back to PNB and receive a tax deduction by contacting their Box Office at 206-441-2424 at least 24 hours prior to your performance. If you are unable to attend a Seattle Opera performance, you may donate your ticket for resale by calling the Ticket Donation Hotline at 206-676-5544. 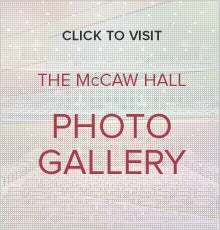 For further information specifically about other McCaw Hall ticketed shows, please click here. What is the first row of each section? Row A is the first row of each section. Does McCaw Hall offer Group Seating? Visit Pacific Northwest Ballet and Seattle Opera for information on their group seating ticketing. When available, McCaw Hall events will offer group seating. Visit Group Sales for more information. Why has Ticketmaster flagged my tickets as 'obstructed view'? In Orchestra 2 and 3, rows B and C have a number of seats listed as obstructed view due to the possibility seats in row A being sold as ADA accessible. We can't guarantee the height of a wheelchair, so the seats are flagged in Ticketmaster's system as obstructed view. In Orchestra 1, rows AA, BB, and CC have a number of seats listed as obstructed view due to a mix position being used for particular shows. Note that not every show uses this mix location. Boxes A, E, AA & EE are listed as obstructed view because the vantage point from these boxes does not allow you to view the full width of the stage. Do you have wheelchair accommodations at McCaw Hall? Yes, McCaw Hall is ADA compliant. You can read more about our various accommodations here. If you have a specific disability access need, please tell the box office when purchasing your tickets. McCaw Hall holds special needs seats as long as possible for our ADA patrons; however, if a show nears selling out, these seats may be released for general sale. I don’t need a wheelchair seat, but I do have another disability. Are you able to accommodate my needs? McCaw Hall is ADA compliant and we strive to accommodate the needs of all of our guests. Please visit Accommodations for Disabled Patrons to read more about the different types of available accommodations. We recommend discussing your needs with box office personnel when purchasing your tickets. Feel free to contact us directly about your particular situation by filling out this form or calling 206-733-9725. I recently became temporarily disabled due to a medical condition (surgery, broken bone, etc), but I would still like to attend the performance. How can I still enjoy the show? As soon as you are aware of a change in circumstances, please contact the box office of the event you are attending. If you are attending a Ballet or Opera performance, it’s best to contact their box office personnel directly for the quickest service. Seattle Opera is available at 206-389-7676. Pacific Northwest Ballet is available at 206-441-2424. For all other shows, contact McCaw Hall by filling out this form or by calling 206-733-9725. It is best to have your ticket information readily available, including the section, row and seat numbers printed on the tickets. Depending on your circumstances, you may be able to use the tickets you originally purchased. If your tickets are in an area that is not easily accessible or may provide a detrimental experience due to your new circumstances, we will work with you to seat you in a comparable, yet accessible, location. Do you have assistance for hearing impaired patrons? Assisted listening devices (ALDs) are available at no charge. The ALDs are available right next to coat check, which is located on the north end of the building, just past the main ticket control area. We do request that you leave a piece of photo ID in exchange for the ALD. The ID will be given back to you when the device is returned. I need to bring my service animal to an event. What do I need to know? Service animals are permitted inside McCaw Hall and must remain on a leash or in a harness at all times. Aisles need to be clear during each performance. If you intend to bring a service animal to an event, please notify the box office when purchasing your ticket so that an appropriate seat may be reserved for you. Standard ADA guidelines regarding service animals apply. Can McCaw Hall provide Sign Language Interpretation?